When you are in Fethiye – a quiet little Turkish town by the coast of the Mediterranean Sea, you have to stay at the Yacht Boutique Hotel. As its name suggest, you can expect beautiful views of the sea with the endless rows of yachts parked by the marina from the hotel (even if you dont have a sea-facing room, you can still enjoy the view during breakfast). Being a boutique hotel, don’t expect huge hotel lobbies with hundreds of staff and busy tourists. Instead at Yacht Boutique Hotel, you get excellent personalised service from the hotel management and classy chic designs in not just your rooms, but also common areas e.g. reception, recreation rooms and even swimming pool. 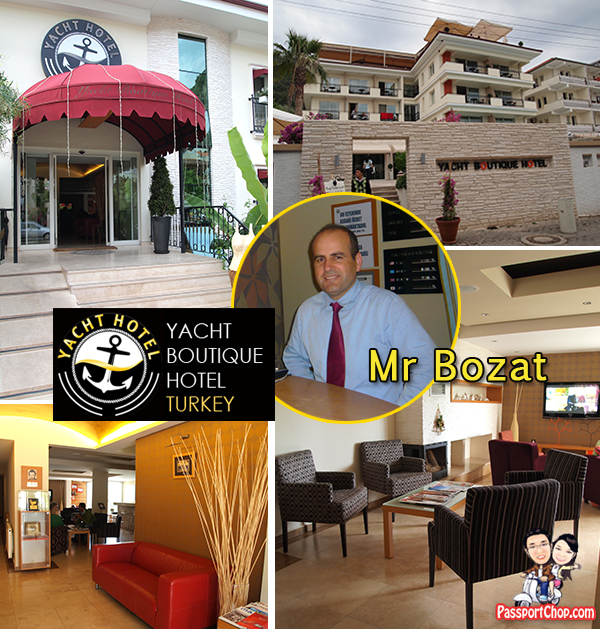 The service starts even before you arrive in Fethiye, the ever so patient hotel manager, Mr Bozat is very responsive to emails and helpful with my queries on what to do in Fethiye and room details. The location of Yacht Boutique Hotel is excellent – just a 8-minute downhill walk to town where you can find food and shopping all congregated together and also very accessible by minibus – just inform the driver “Yacht Boutique Hotel” and he will drop you off right by the doorstep. We had made reservations for a double room w/o balcony for €75 per night and we were surprised by the free upgrade to a family suite on arrival. The room was spacious with 1 king-sized double bed and 2 twin beds. We also had a lovely little balcony to enjoy views of the marina. The shower room was also great with magnifying mirror and nice bathroom amenities e.g. shampoo and bath gel all professionally packaged. On our return from our 2D1N Ephesus-Pamukkale tour (with Fethiye as our base), we were given the double room we had reserved (without balcony – just a window with a view of the road outside the hotel). The rooms were very small, with barely enough walking space for 2 adults after 2 big luggages were opened up. Still it felt quite comfortable and cozy. 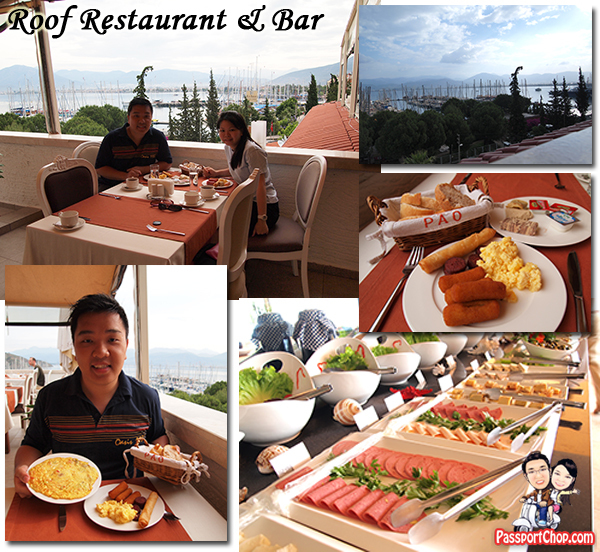 Another great thing about the Yacht Boutique Hotel was the sumptuous full buffet breakfast. You have a wide selection of cheeses and ham from the Continental buffet spread as well as a yummy hashbrowns, scrambled eggs and omelette choices from the American buffet spread. You will also get to try various Turkish specialities during breakfast. The service staff at the restaurant are just as helpful and keen to share with us the local Turkish tea and patiently explaining to us the difference between Lipton apple tea and Turkish apple tea. The swimming pool and outdoor bar area completes the coolness of this hotel – at night, the swimming pool and outdoor bar becomes a party area where guests can chill out at the many beautifully designed sofas and even beds! Even during the day, guests can suntan at the many deck chairs around the pool. For more info and reservation requests, go to: http://www.yachthotelturkey.com/eng/yacht-hotel-contact/. Tell them PassportChop.com recommended you this hotel. If you are arriving from Fethiye otogar (the main bus station), you can request for a free shuttle to drop you off at the hotel doorstep. You make a very valid point. I appreciate how you communicated it. Looks like one of the best hotels I have ever seen in Turkey. Mind you I always think that Fethiye is one of the best places to visit. I passed through for three days but want to go back for longer. Will check out this hotel when I do. I am doing the research entitle “Foreign Tourists’ Behavioral Intention to Visit Boutique Hotels in Bangkok”. Could you please help me to do a questionnaire? Once you make it to Fethiye, you must try these 2 nights / 3 days or 3 nights / 4 days boat trips departing from Fethiye to Antalya. One of the best experience in one’s life at Mediterranean coast in Turkey thought it might be a little costly it is worth to try. Nice hotel with different and good facility. I am planning for the holiday in turkey. Now i will keep your hotel in my mind!!!!! As i visited in Different place now i want to go some different place. Nice place…a pity singapore doesn’t have any nice boutique hotel with such a great view.